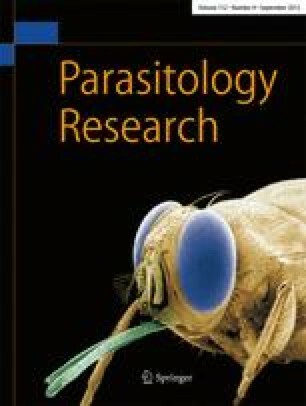 The effect of hepatic granulomas initiated by eggs ofSchistosoma mansoni on the ultrastructure of hepatocytes of murine hosts was studied. Specimens of infected livers were collected at half week intervals, starting at week 7 postinfection and terminating at week 9 postinfection. Only the hepatocytes adjacent to granulomas showed any alteration in structure. The most obvious change was the proliferation of smooth-surfaced endoplasmic reticulum, especially striking in samples collected 8 1/2 and 9 weeks postinfection. The hypothesis was presented that the material secreted by the egg of the organism might be responsible for what appeared to be a morphologic detoxification response by the hepatocytes. Other alterations evident in the hepatocytes were an increase in the lysosomal population, mitochondrial changes and a slight hypertrophy of the Golgi complexes. Previous related studies by other investigators were explored and the findings compared with the results of this study.